TRIFA is a German company, founded in 1929 specializing in automotive lighting manufacturing which has won the European and world markets with its impeccable quality and competitiveness of their products. 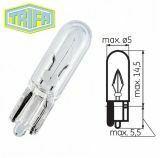 Trifa offers a grea variety of automobile lamps, auto halogen bulbs and others. The company aims to meet the diverse needs of its customers in the automotive industry, observing all legally required standards and offering only premium quality products with a guarantee for safety and reliability. In support to this objective, TRIFA complies to ISO 9001: 2000 - System for quality management, the company also has established its own laboratory for testing and photometric measurement to ensure that all the ECE standard requirements and other relevant standards can be measured and controlled on site before being marketed. VIKIWAT Ltd. is an authorized distributor of a wide range of TRIFA lighting products. In our store you can find a rich selection and in stock quantities of automobile incandescent lamps, halogen auto bulb, automotive bulbs for car boards and more with attractive prices and fast delivery. Auto filament lamp, BAX10d/B8.5d, 12V, 1.2W Car filament lamp with supply voltage 12 VDC and power 1.2 W. Base BAX10d/B8.5d. Auto filament lamp, BX8.4d, 12V, 2W Filament filament lamp, 12 VDC supply voltage and 2 watts output. Socket BX8.4d. 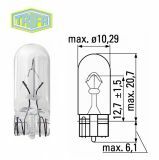 Auto filament lamp, BX8.4d, 12V, 1.5W Car filament lamp with supply voltage 12 VDC and power 1.5 W.
Auto filament lamp, BX8.4d, 12V, 1.3W Car filament lamp with supply voltage 12 VDC and power 1.3 W.
Auto filament lamp, BAX10d/B8.5d, 12V, 2W Car filament lamp with supply voltage 12 VDC and power 2 W. Base BAX10d/B8.5d. Auto filament lamp, BAX10d/B8.5d, 12V, 1.5W Car filament lamp with supply voltage 12 VDC and power 1.5 W. Base BAX10d/B8.5d. Automotive filament lamp, B8.3d, 12V, 1.2W Auto filament lamp. Power supply voltage 12 VDC and power 1.2 W. Socket B8.3d. Car lamp, 12VDC, 3W, W3W, W2.1x9.5d W3W incandescent filament lamp, 12 VDC supply voltage, 3 watts power, W2.1x9.5d socket. The lamp is used for interior lighting in cars, dashboard, stop, turn signals. Wedge base lamp, 12 VDC, 5 W, W5W, W2.1x9.5d Wedge base lamp W5W with voltage 12 VDC and wattage 5 W, base W2.1x9.5d. 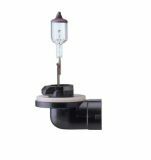 The lamp is used for interior lighting in cars, switches, gauges, ceilings, stops. 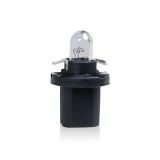 Car Halogen Lamp, H27W / 2, 12VDC, 27W, PGJ13 Halogen bulb H27W / 2, supply voltage 12 VDC power 27 W, socket PGJ13. The lamp is suitable for headlamps and fog lights. Wedge base lamp, W3W, 24 V, 3 W, W2.1x9.5d Wedge base lamp, with voltage 24 V, wattage 3 W and base W2.1x9.5d. The lamp is used for dashboard, turn signals, gauges, ceilings, truck stops and buses.